The Castelli All Out Speed Suit combines two of their most popular triathlon-specific offerings into one high-performance package. 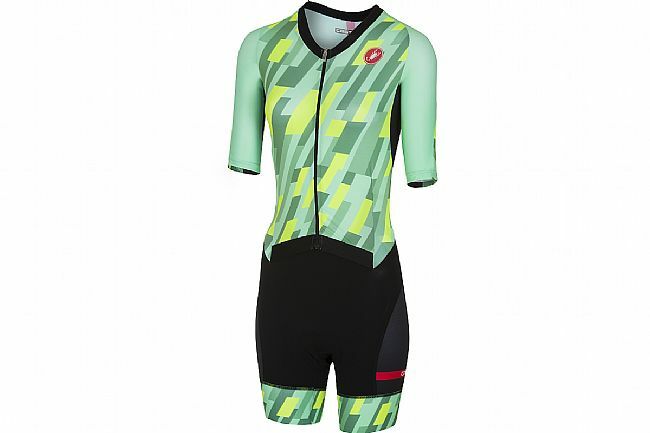 This long-course race suit makes no compromises in its pursuit of speed, proving fast (and comfortable) enough for all-day races or training days. Combining their T1:Stealth Top for all-out aero performance with a short portion based on their Free Tri Short for comfort on the bike and support on the run, The All Out Speed has it all. A Sanremo front construction with full-length zipper increases the comfort, while also allowing for easy nature breaks. Inside, Castelli's KISS Tri seat pad is a multi-density cushion designed for the aero riding position, disappearing during the run or swim. Upper portion built from the T1:Stealth Top for all-out aero performance on the bike. Short portion based on Free Tri Short for comfort on the bike and support on the run. Sanremo front construction allows nature breaks and comfort. Claimed weight: 185 grams (large).